We have been interviewed live on MSNBC, and numerous radio financial talk shows. We have provided commentary research to The Wall Street Journal, The New York Times, CNN, Bloomberg, Forbes, Yahoo Finance, many TV news stations, newspapers and magazines such as Consumer Reports and Reader's Digest. We have extensive inside auto buying experience as new car buyer's agents, interfacing between car shoppers and new car dealers, securing maximum discounts for buyers, and pooling expertise from countless auto industry insiders. We provide Free Spreadsheet Tools for you to download to help you determine the best price to offer car dealers based on proprietary scientific methods we have developed, which have proven over the decades to be more accurate than other car buying advice sites. We provide you with tools that help you budget your new car purchase and buy and sell used cars effectively while avoiding any scams. These tools combined with our online guides comprise the powerful core of our CarBuyingTips.com site. Car buyers report back to us that these tools and guides were the most fruitful part of our site for their negotiations. Most people know CarBuyingTips.com for these tools, guides and for our famous Top 10 Car Dealer Scams list, which is often copied by other sites. Lastly our guides are the most detailed and informative on the internet for educating you to be the savviest car shopper you can be. As a free public service, we'll review your car purchase quotes free of charge after completing our car buying spreadsheets, to help determine if you are getting a good deal on your purchase, and coach you free of charge on your next steps for success. This is what has made us so popular among car shoppers, and this power has enabled thousands of car buyers, both male and female to save an average of $2,000 to $4,000 on new cars, and they saved $4,000 to $8,000 buying new trucks. Additionally, our in-depth coverage on extended warranties and all the scams to avoid makes us unmatched in detail by anyone else. Our detailed guides are the true litmus test metric of our success in educating the car buying consumer, along with major news outlets relying on our expert commentary to educate car buyers. With our free proprietary spreadsheet tools and unmatched thorough online educational guides, we help consumers level the playing field. We teach you how to find true dealer cost on new cars and how you can get the best price possible with a fair dealer profit. We provide useful, easy to follow examples, negotiating tips, rock solid financial tips based on years of proven financial responsibility preached by financial experts, and we give you free used car bill of sale spreadsheets. We provide honest reviews of the most useful car buying and financing sites that we have thoroughly checked out. We don't recommend any site that we have not thoroughly investigated independently. Every single site we link you with is a company we hold in high esteem, we fully trust them, or we have used them ourselves. They are often fellow automotive industry insiders, directors and CEOs whom we know personally, not just unknown corporations. We know people who have used them, and we have a high degree of trust in the companies we recommend on this site. We analyze loan and lease dilemmas, expose dealer scams, sneaky dealer ads and help you make all the tough decisions when it comes to a major purchase like a new vehicle. Our goal is to save you the most money possible and be the best free consumer resource on the web. We hate to see you scammed by the “morally challenged,” so enjoy this politically incorrect site that car dealer lawyers tried to shut down. CarBuyingTips.com was founded in 1997 by Jeff Ostroff, an engineer with Motorola, who was also a lifelong consumer advocate. Jeff recognized in the early days of the internet that he could get the word out to the masses, and he could educate mass volumes of consumers worldwide the same way he had coached numerous coworkers over the years in the fine art of buying new cars after fending off numerous scams himself from unscrupulous car salespeople over the years. Like Jeff Bezos of Amazon, who started the company in the garage of a rented house, Jeff Ostroff founded CarBuyingTips.com in the humble loft office in his own home. He was joined by other cofounders who were engineers at Motorola with the same fiery zeal to educate and protect the car buying consumer, after seeing first hand all the scams that consumers are faced with. With the pulse and feedback of the car buying public, fast forward 20 years, and we have helped thousands of car shoppers save over $15 Million dollars based on visitor feedback metrics. These results prove we are the first authority in buying cars, and we are so painfully truthful in pointing out car dealer scams and false advertising that car dealer lawyers tried and failed to shut us down. Sought out often by the media for commentary, Jeff founded CarBuyingTips.com in 1997 as a series of articles on another site he created, then developed CarBuyingTips.com as a standalone web site in 1998. Jeff has over 25 years active experience as a consumer advocate who coaches car shoppers with savviness, educational guidance, professionalism and expertise in car buying. Jeff has also extensively investigated and reported about online fraud plaguing all online classifieds sites such as eBay, Craigslist, AutoTrader, Cars.com and numerous other online shopping portals. Jeff has recovered thousands of dollars wired overseas by defrauded buyers, as well as thousands more in expensive luxury goods for sale stolen from unsuspecting sellers. Jeff has also assisted the FBI with information from his investigations and has trained the Secret Service in the specifics of online fraud. Jeff holds a BSEE from Florida Atlantic University, interned at IBM in Boca Raton, FL, and is a former Electrical Engineer at Motorola. A founding Contributor and Vice President of CarBuyingTips.com, Lyle has over 20 years of experience as a consumer advocate and technical website developer. Lyle has been one of the foremost researchers into all aspects of the automotive sales industry. 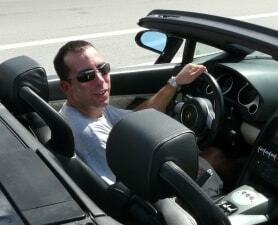 The findings of his research help shape the most useful content on CarBuyingTips.com. He has been an auto industry insider since 1999. Lyle has worked with other automotive industry websites to improve their offerings and performance based upon feedback from CarBuyingTips.com visitors. 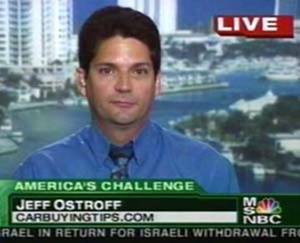 Our Founder and Editor-In-Chief Jeff Ostroff is available for interviews even on short notice. If you need to speak to us here at CarBuyingTips.com or interview us for a story you are working on with a fast-approaching deadline, please use our Press Contact Email Form for results as fast as possible. 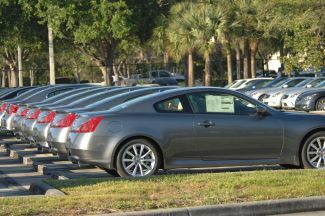 See our Press Newsroom Page for more a more comprehensive list of news articles quoting CarBuyingTips.com.